Close to Omaha Beach, Matakana Village and the Farmers Market which is only a short drive away. 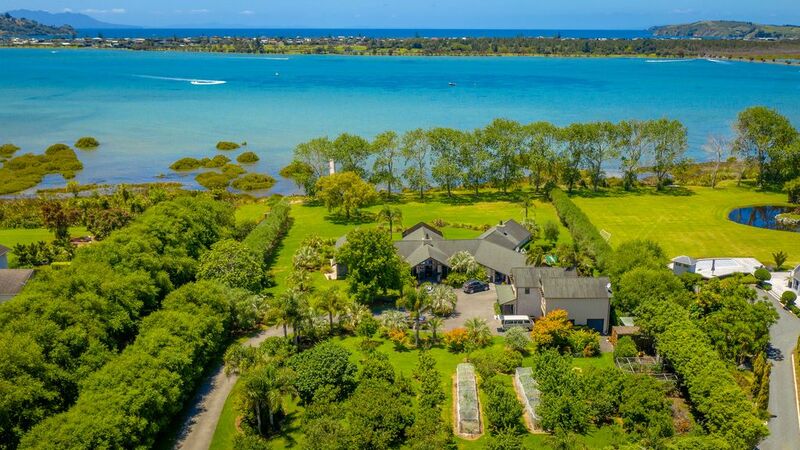 Warkworth township is 15 minutes away with local attractions including Morris and James Pottery, The Matakana Wine Trail, Restaurants and cafes, Goat Island Marine Reserve, Golf Course, boat ramp, fishing, water sports, surfing, horse riding. North facing cottage with two levels overlooking tropical gardens and orchard. Access to jetty from front lawn. This property is not to be missed by guests wanting a quality property with privacy. No Smoking, No Pets, no wheelchair access. Minimum two nights. Barbara & Conrad owners of the property. Lived in Auckland for most of their lives before moving to Omaha to get away from the hustle and bustle of city life. 2 acres of beautiful gardens set amongst palm trees situated on the waters edge away from the fast moving pace of city life. Purchased 16 years ago as a 2 acre block of bare land and developed it into a stunning lifestyle residence. Only 1 hours drive from downtown Auckland yet far enough away to enjoy the peace and tranquility. Situated on the Whangateau estuary right on the water with a 20 metre jetty on the front lawn looking across to the Omaha Golf Course. From the time we arrived at the property there was a big smile on our faces. Our welcome from Barbara with beautiful table display of flowers and basket of freshly picked plums topped it off. The rooms were beautifully presented. The property in a lovely landscaped garden. A beautiful spot with gracious hosts. We very much enjoyed our stay. The rooms were spotless and spacious, and the design was such that we had a great common area, but couples had their own private spaces if/when they chose. We were given the run of the grounds, and the scenery was terrific. Our hosts were helpful but certainly gave us privacy. One small glitch was internet access, which was available in the porch area of their home - Conrad was already in the process of fixing that. Ironically, this was our second choice - the other property cancelled. What a lucky break! This was far superior. We weren't terribly interested in metropolitan Auckland, and the Matakana area had loads of interesting sights, including the Saturday market, where our hosts had booths. Don't miss Omaha Beach, Goat Island area, the kite surfers on Snells Beach, or the wineries. All in all, a very cool experience. If you're not a local, do be prepared for longer driving times. If we ever pass this way again . . . first choice. Thanks to Conrad and Barbara for sharing a beautiful place. Thank you Jim for your kind words. Look forward to perhaps seeing you again . What a wonderful holiday we had - hosted by the lovely Barbara and Conrad Blind at their delightful holiday cottage beside their property in Point Wells. The cottage is immaculate, spacious, clean and modern, and is only 10 minutes from the beach at Omaha - but private enough to escape the holiday crowds. Thank you again for your hospitality - it was great to meet you both and we hope to come and stay again :) Loved it!! Lovely and easy short break away! We are close by all the above amenities but still enjoy the peacefulness of a relaxing holiday in luxury accommodation.